Creating enough nanovesicles to inexpensively serve as a drug delivery system may be as simple as putting the cells through a sieve, according to an international team of researchers who used mouse autologous — their own — immune cells to create large amounts of fillable nanovesicles to deliver drugs to tumors in mice. Nanovesicles are tiny sacs released by cells that carry chemical messages between cells. 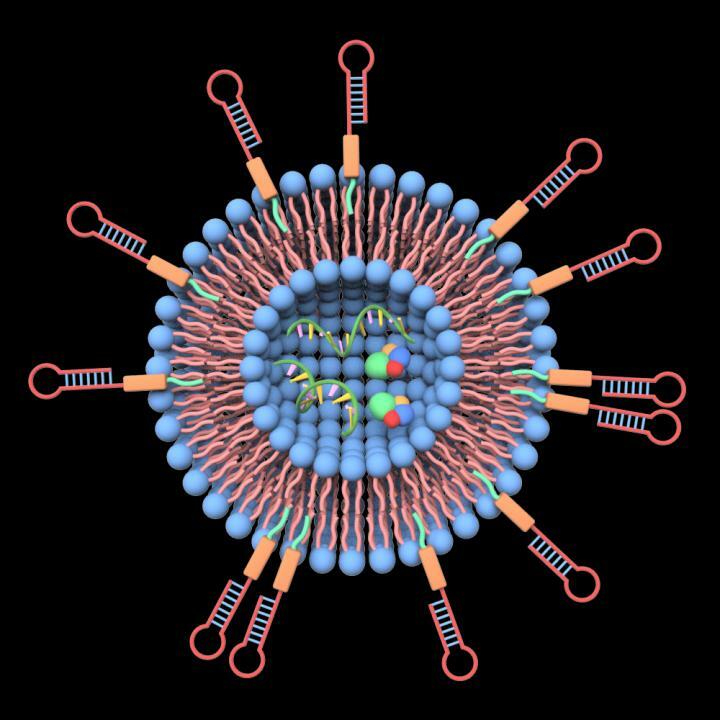 These nanovesicles are natural delivery vehicle and useful in drug delivery for cancer treatment. "Currently, natural nanovesicles can be harvested from cell culture supernatant (the fluid surrounding cultured cells) and they are fillable," said Yuan Wan, postdoctoral fellow in biomedical engineering, Penn State. "However, there are two problems using them for cancer treatment. There aren't enough nanovesicles produced in short timescales and they do not have targeting effect." The researchers developed an approach and platform to create large amounts of fillable and targeted nanovesicles. They report their results in a recent issue of Cancer Research. To create targeted nanovesicles, ligands — perhaps short pieces of protein — need to be attached to the nanovesicle wall so they can recognize tumor cells. The process for making targeted nanovesicles now requires using viruses to insert relevant DNA fragments into the genome of the donor cells and then collecting ligand-bearing nanovesicles released from the gene-modified cells. Yuan, working with Si-Yang Zheng, associated professor of biomedical engineering, developed a simpler and faster method for attaching ligands. The researchers chemically graft the lipid-tagged ligands onto the cell membrane. They do this before they pass the cells through a sieve, which converts the cell membranes into millions of vesicles bearing ligands that can be filled with an appropriate drug to target the cancer. "Pushing the cells through a filter is the engineered way to produce lots of nanovesicles," said Zheng. The researchers used mouse autologous immune cells and created the ligand-targeted, fillable nanovesicles in the laboratory. They then infused these drug-loaded nanovesicles into the original mouse to treat tumors. "This approach enables us to create nanovesicles with different ligands targeting different types of tumors in about 30 minutes to meet actual needs," said Zheng. "With this approach, we also can put different types of ligands on a nanovesicle. We could have one ligand that targets while another ligand says, 'don't eat me.'" Zheng is referring to the body's propensity to clear materials that do not belong from the blood stream. If a nanovesicle has a ligand attached that suggests the vesicle is autologous, then the vesicle, and its drug payload, might remain in circulation longer, making it more successful in finding and killing the target cancer cells. The researchers believe that a variety of other cells, including stem cells, T cells — cells of the immune system — and other cell types could be modified and used as donor cells for extrusion of nanovesicles. Also working on the project at Penn State were Yiqiu Xia, graduate student in biomedical engineering, and Gong Cheng, former postdoctoral fellow in biomedical engineering. Others working on this project include Chuandong Zhu, Qin Zheng, Jinlong Tong and Yuan Fang, Second Affiliated Hospital of Southeast University; Lixue Wang, Second Affiliated Hospital of Southeast University and Jiangsu Cancer Hospital & Jiangsu Institute of Cancer Research; and Xia He, Jiangsu Cancer Hospital & Jiangsu Institute of Cancer Research; all in Nanjing, China. The Nanjing Science and Technology Development Foundation, Jiangsu Provincial Medical Youth Talent Award, Natural Science Foundation of Jiangsu Province and the U.S. National Institutes of Health supported this work.